We’ve registered our discontent with the racket that is “festival dressing” before, in part because of the narrow, close-minded, and often boring scope of what is considered “festival dressing.” One demographic that is deeply ignored in festival-outfit trend pieces is the modern corporate raver, whose aesthetic is as defined as the fringed faux-bohemian Coachella girl. That said, contemporary USA rave styles have not really advanced so much since the late 1990s—kids whose parents hadn’t even met by the time the Second Summer of Love rolled around are still frequenting fests like Electric Daisy Carnival, HARD, and Electric Zoo in full-on kandi, fluffy boot covers, booty shorts in various shades of neon, tutus, pacifiers. While the chutzpah it takes to roll out the door dressed like a PLUR anime doll is admirable, as fashion goes, it’s really time to move on to reflect the climate of the times—for instance, the fact that it is now possible to go on the internet without disconnecting your telephone cord and plugging it into your 100-pound, tan plastic PC. We are living in an age that the storied OG ravers of the past could only dream of; even The Prodigy is dressing like it is 2015. Time to think about moving on! While attending Electric Daisy Carnival New York this weekend, somewhere between a buzzy, ancient-sounding Benny Benassi set and a pop-spectacle extravaganza from Calvin Harris, we compiled a list of ideas for contemporary EDM festival ravers to step up their estilo. We’re all blowing it by not making like the Pine City Grade School Basketball Team, 1931-1932. If you wanna go full-on throwback, look into the past to eighth grade volleyball and/or ‘90s Janet Jackson dance routines into the glorious world of kneepads, which are a subtler alternative to wookie boots in a simpler, more minimal era of dressing. A viable alternative: knee bandages, although the kneepad allows for more creative dance moves whilst raving. Unfortunately and unbelievably, some ravers purporting a PLUR lifestyle are still wearing “Native American” headdresses to their festival jaunt, in fact being the antithesis of PLUR and looking dumb as hell to boot. People, stop doing this. Here is one alternative to your feathered headdress, if you’re absolutely dying to wear something on your head but are interested in maybe not looking an appropriative and mis-attributing idiot: medieval headgear designed to mimic the fantastical horns and crown of a satyr. To the satyr’s end. While there is some distinct goth/raver crossover in corpo EDM fest fashion—particularly with men who dress as Sub-Zero or other Mortal Kombat characters, with masks made of elaborately weaved kandi—there is so much room for more, especially because the love for the theatrical knows no bounds. Why aren’t there more raver vampires? Or medieval raver nurses? The possibilities with cross-genre pollination are endless. The popularity of Vibram FiveFingers aka The Foot Glove is a seemingly non-useful disgrace—they are running footwear of debatable safety and vomitously ugly to boot. And yet, in the context of a corporate rave is just about the only place that wearing them would make sense. They probably feel great on your feet if you’re rolling, and they automatically make you look like a cyborg. What’s not to love? WARNING: Execute in this context ONLY. Please tell us about all your alternative raver looks, we can change this culture together! 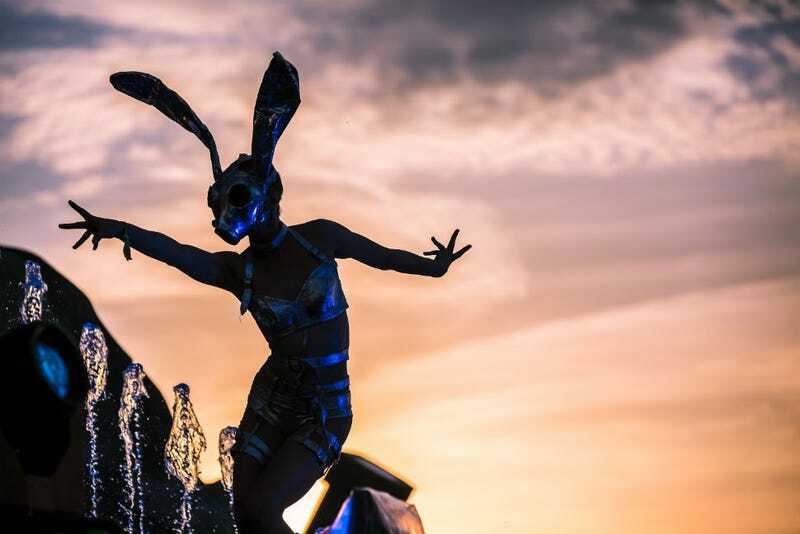 Image via aLive Coverage for Insomniac/EDC NY 2015.